Freedom Bound is a 12 month Block of the Month program starting in September 2016. Quilt measures 97x97 completed. There are 4 bonus projects (3 quilts and a wall hanging.) It takes 9 yards of 45" backing. 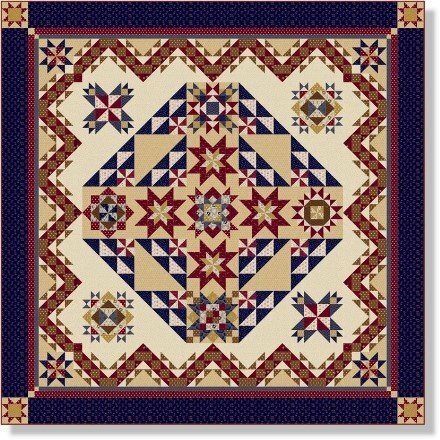 The price is $25.00 per month and a $25.00 registration fee includes pattern and fabric. Your credit card will be on file and charged monthly for 12 months on the 15th of each month. We ship via USPS Priority Mail and estimate this charge at $7.00/month if needed. Registration ends Wednesday, August 31st and limited spots are available. Call the shop with any questions, 904-374-0532.